With over 75 years’ experience, we not only provide domestic and commercial clients with professional removal services in the UK, but across Europe as well. We understand that moving house or office is difficult, which is why our removal service is carried out to the highest standard. Our expert movers also know that moving countries can be even more stressful, so make your relocation as easy as possible by dismantling and reassembling your furniture for you, full or part packing your belongings and even providing secure storage facilities if you need some items to remain in England while you move. Get in touch today by calling us on 01233 646478 or by sending us a message through our contact form to arrange your FREE, no obligation quotation and to speak to a member of our European removals team. From anywhere in the South East and London to anywhere in Europe, we provide all of our customers with project management for their removals to help streamline the process and take away the stresses of moving. If you have anything that you would like to move at a later date or want to store office furniture or important documents in England, then we also provide a secure storage service with intruder alarms, monitored CCTV and fully trained operatives to keep your items safe. 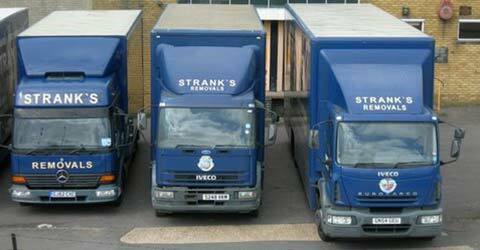 No matter your requirements for domestic or commercial removals, when you are looking to move to a location across Europe, make sure you use the specialists at Stranks Removals. We are proud to be a part of Referenceline, meaning all of the feedback our clients give us about our handling, packing, value for money and customer service is submitted to an independent website, making it completely honest. Based in Ashford, we provide our European removal service for clients across London, Kent and the South East. We have recently relocated clients to Europe from Lenham, Tenterden, Staplehurst, Ashford, Romney Marsh, Kingsnorth, Chartham, Barham, New Romney, Folkestone, Charing and Canterbury. Call us today on 01233 646478 or send us a message through our contact form to learn more about our European removal service as well as to arrange your FREE, no obligation quotation with a friendly and professional member of our team.